The «Contents» page lists all Contents your document contains. When hovering over an item the «Show in document» button (1) appears. Clicking it will highlight the associated content in your document. The selection indicator (blue bar) (2) will appear for each linked item that is currently partly or fully selected in the document. 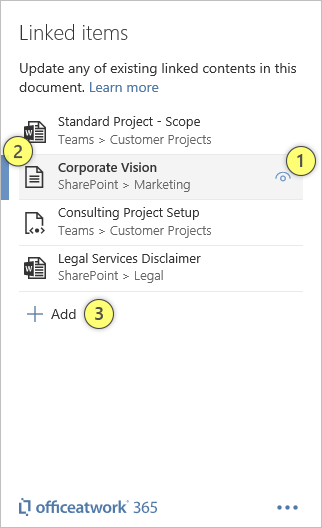 Use the «Add» button (3) to upload your current selection as new content to a content library in either SharePoint, Teams or OneDrive. This process will automatically create a new linked item once completed. 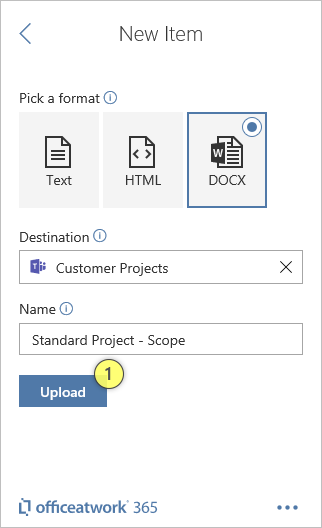 Clicking on the «Add» button at the bottom of the «Linked Items» list will enable you to upload new content to one of your existing «Content Chooser» content libraries in SharePoint, Teams or OneDrive. The «Pick a format» option will determine in what file format the new content will be created in. The «Destination» field will allow you to choose the library and folder in which the new content will be created in. Clicking on the «Destination» field will present you with a «Select Destination» fly-out allowing you to navigate and choose among the different content libraries and their sub-folders available to you. The «Name» field will allow you to specify a name for the new content that will be created. Finally, the «Upload» button (1) will upload your current selection in your document as a new content file according to the settings you defined above. Once uploaded the Add-In will return to the «Linked Items» list and show the newly uploaded content as a new linked item.